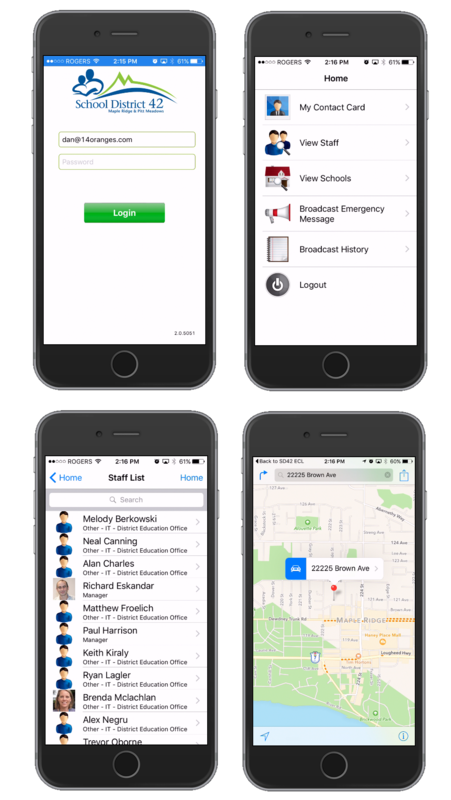 The Emergency Contact List (ECL) app is an app used internally by the School District 42 to help their teachers and administrators keep track of who they should contact in case of an emergency. In the case of an emergency, the app will allow you to view the current contact card for each employee, browse and search the entire employee directory as well as initiate calls or emails to anyone in the list. The app will also let search the entire school district directory for staff assigned to each school, initiate an emergency broadcast message that is PIN protected to all users in the system via push notifications. For this app, we created back end services such as central server/database and an administration portal that allows the school to add the employee and school info and the relationship between the employees. The app keeps a local copy of the information to ensure the data is available locally in case of power outage.